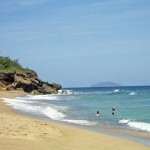 These beaches are located in the Puntas barrio (neighborhood) of Rincón, on the Atlantic Ocean. 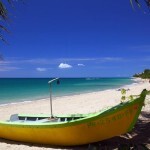 There are a number of informal restaurants, guest houses, inns, and funky beach bars scattered along these beaches. 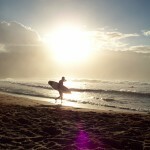 The waters are rougher in the winter, ideal for surfing and wind surfing, and calmer the rest of the year. They also provide a great vantage point to watch the whales during their annual migration, December through March. To get to the Fun Coast from the condo, drive north on Route 413. At the fork in the road (the road to the left leads to the lighthouse), bear right up the hill, and keep going until you reach Puntas Bakery on your left. You can turn left at that intersection and drive all the way down to the beach road. Or you can turn left onto any of the roads between the bakery and the Speedway gas station — they all end up at the Fun Coast. The beaches are listed here from west (closest to the condo) to east. Pools Beach: Located at the western end of the Puntas beach area — this is the first beach you find if you turn down the hill at Puntas Bakery. 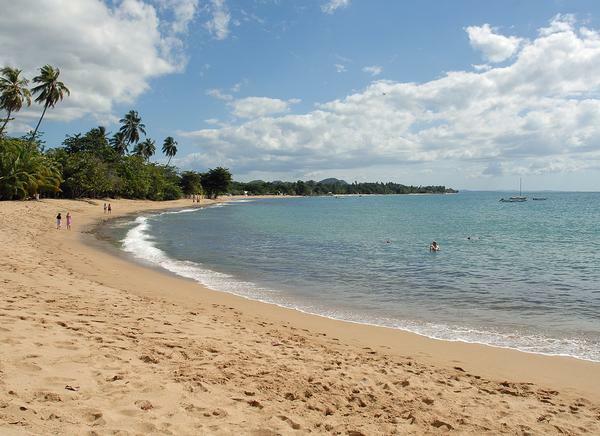 A favorite choice for families with children, Pools Beach offers a fairly calm, protected area for swimming and plenty of space for playing in the sand, as well as great snorkeling. To get to the beach, you’ll have to climb down a small incline without any steps or pavement. At the eastern end of the beach, there is a rocky point that separates Pools Beach from Sandy Beach. This is known as Siete Barrasos. According to local folklore, Cofresí the Pirate made seven marks on a rock outcropping that looks like the island of Puerto Rico. The marks represent seven places around the island where he buried his pirate treasure. Pools Beach has no public facilities, restaurants, bars or shops. Antonio’s Beach: Named after the owner of the land that borders the beach, this beach is much quieter than Sandy Beach and extends all the way to the area near the public parking lot. If you want to relax and “get away” from the action, this is a great option where you can still watch the surfing and windsurfing offshore in winter, while enjoying a calmer beach environment. Antonio’s Beach is a favorite place for beachcombing for sea glass. River Mouth Beach: The last of the beaches on the Fun Coast is located east of the public parking lot beyond Antonio’s Beach. There are tidal pools here, so the swimming is good year-round and it’s a good choice for children. 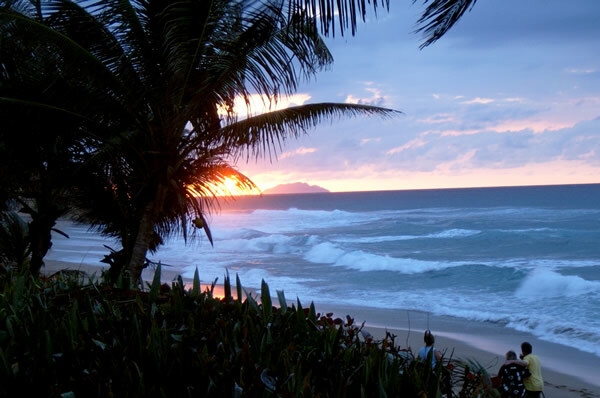 Rincón is best known for its surfing beaches and its sunsets, and the Sunset Coast is where you’ll find both. While the Fun Coast has great surfing, the wildest waves break where the Atlantic meets the Caribbean off the Sunset Coast. The winter season shows off the “wild side” of the Sunset Coast, but the rest of the year the beaches calm down and become secluded hideaways for romantic strolls, snorkeling and enjoying a relaxing day at the beach. 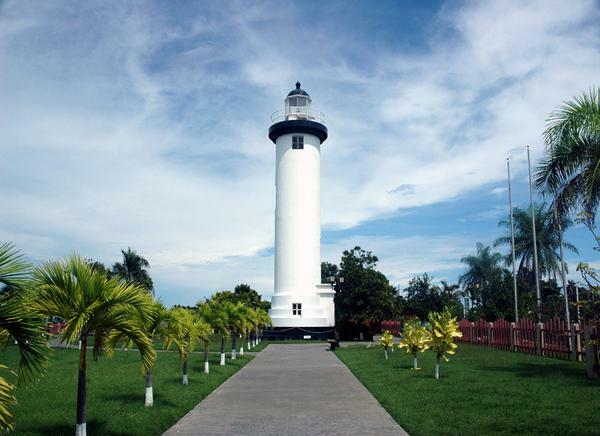 This area is also home to the future Science Center and Museum (formerly a nuclear power plant), the Punta Higüero Lighthouse and park, and the Tres Palmas Marine Reserve. To get to the Sunset Coast from the condo, drive north on Route 413 until you see the fork in the road — take the left road toward the lighthouse. The beaches are listed here from north (farthest from the condo) to south. 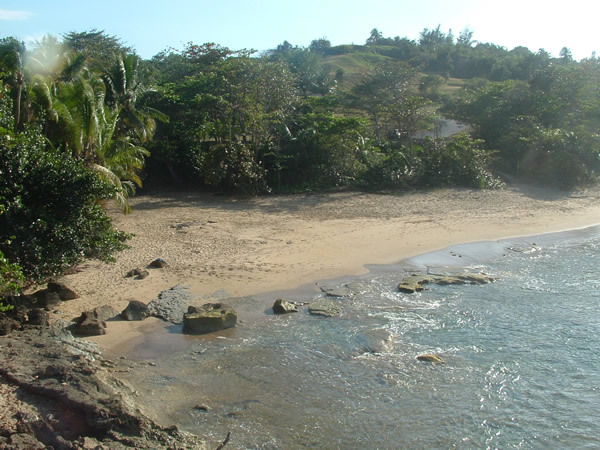 Spanish Wall Beach: This is Rincon’s “secret beach” that you can reach only by hiking from Domes Beach via a trail. 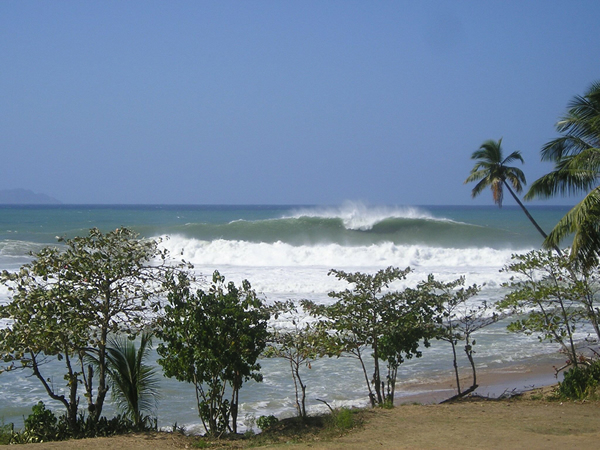 Located at the very “corner” of Rincon (the westernmost tip), this is where the Atlantic Ocean and the Caribbean Sea meet, so it has one of the best surf breaks — you’ll enjoy the action during the winter surfing season. This is also a great area for collecting shells and “getting away from it all.” You can no longer walk all the way around the corner to the Fun Coast, so you’ll have to hike back the same way you came. 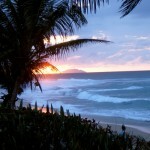 Domes Beach: This is one of the most famous surfing beaches in the world. It’s named after the dome of the old nuclear power plant. 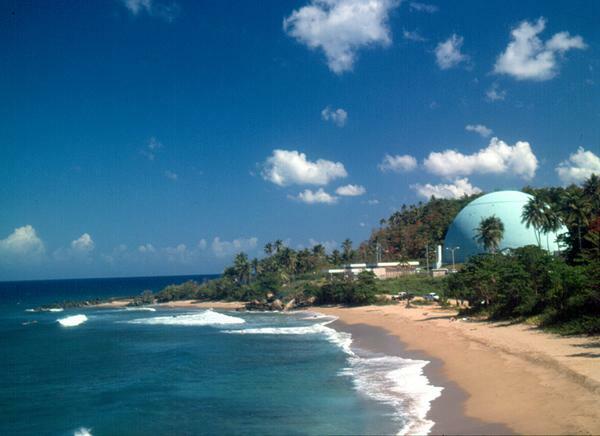 The plant was decommissioned and cleaned out decades ago, so don’t worry about radiation emanating from the dome. It’s currently being converted into a Science Center and Museum. To get to Domes Beach, drive past the Lighthouse Park and look for the whale-shaped beach marker. This is also a great place for whale watching in winter, and it’s almost completely empty in summer if you want to have a beach all to yourself! 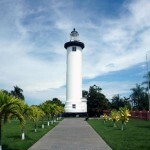 Punta Higüero Lighthouse & Park: You can’t visit Rincón without at least one visit to the lighthouse. During the winter season you can watch surfers and whales from the walk that runs along the top of the cliffs. There are no real beaches that are accessible to the public, but you get great views of Domes Beach to the right and Indicators Beach to the left as you look out toward Desecheo Island. Just below the lighthouse is one of the most famous surfing breaks in Rincón, known as “Deadman’s” for the nasty rocks jutting out from the cliffs. You can see it if you look right down from the lighthouse park for the rock that looks like Christopher Columbus’s head. No matter what time of year you visit, the lighthouse provides a great photo opportunity. There are also a shop with lots of information and souvenirs, a snack bar, and public rest facilities. Indicators Beach: Just to the south of Lighthouse Park, this is one of the best places to park your car, climb down the incline and watch the surfing action during the winter season. There are no hotels, restaurants, bars or public facilities, but the Lighthouse Park is just up the road, so there’s plenty of free parking available. During the low season, when the surf isn’t up, this beach is almost completely empty, and it’s a good choice if you want a private beach for a romantic stroll or complete relaxation. Indicators is a very rocky beach, so this is not a good choice for swimming. 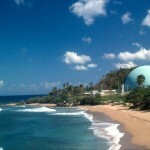 Maria’s Beach: During high season, this is the center of surfing activity in Rincón. Look for the whale-shaped beach sign on your way to the Lighthouse Park, and pull into the parking lot next to Calypso Cafe. 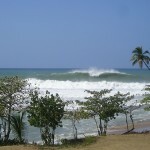 This is where the waves kick up and provide some of the most exciting surfing in the Caribbean! The rest of the year, the beach changes character and becomes a great place to enjoy the sun, sand and a typical Caribbean day at the beach. Steps Beach/Tres Palmas Marine Reserve: This is another legendary surfing beach, which got its name from the set of steps that clings to the beach. 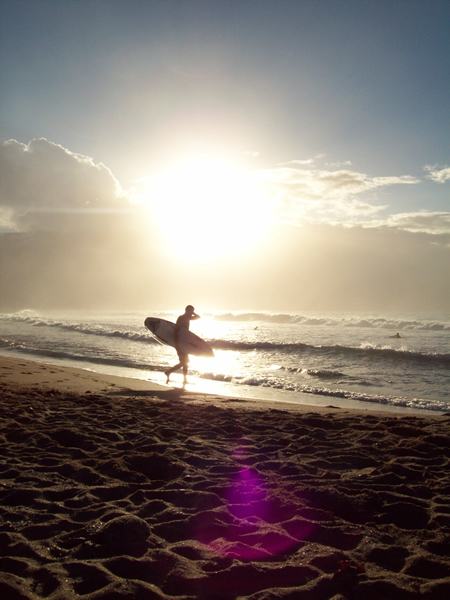 In surfing terms, Steps is the “inside surf break” and Tres Palmas is the “outside surf break,” so you’ll hear this beach referred to by both names. To get to Steps Beach you have to look carefully for the whale-shaped sign that is only visible as you are driving on Route 413 from downtown Rincón toward the Lighthouse. To make it a bit of a challenge for visitors, the name of the beach on the sign is in Spanish: “Playa Escalera.” This beach is too rough for swimming during surfing season, but it becomes very calm during the off-season and is a favorite spot for snorkeling, since it’s the site of the protected Tres Palmas Marine Reserve. 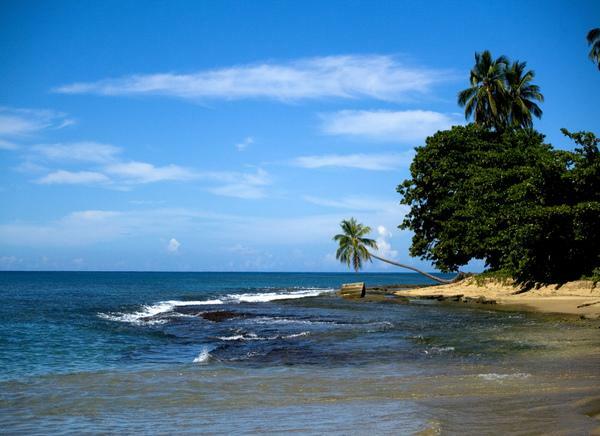 The Caribbean Coast of Rincón is perfect for travelers looking for miles of palm-lined beaches with calm, blue Caribbean waters which are perfect for swimming and water sports. The tourist resorts are located in this area, and you’ll find lots of restaurants and beach bars centered around the resorts. 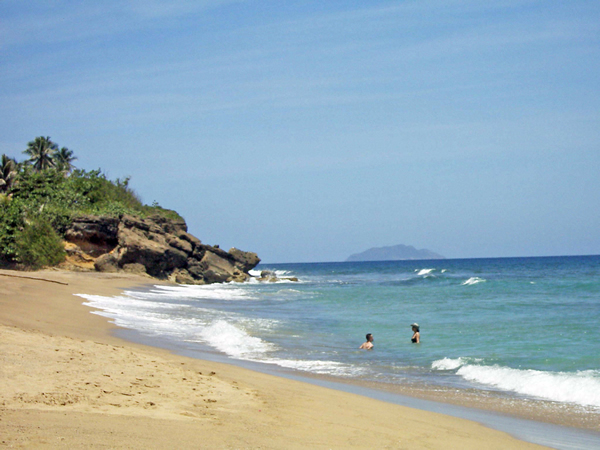 All of the beaches in Puerto Rico are open to the public, so you can enjoy the action in front of the resorts or find a side street that provides access to less-crowded beaches away from the hotels. Although the Caribbean beaches are great for swimming, there are no lifeguards, so make sure to supervise children on the beach. 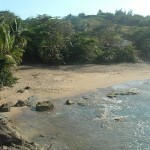 Rincón Public Beach (Balneario de Rincón): This is the beach just across from the condo, one block away. It’s popular with local families and tourists for swimming in its clear-blue water and is a great place for snorkeling and collecting seashells and sea glass. 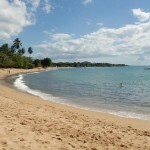 This is a fully equipped beach: it has lots of free parking, picnic areas, public restrooms, showers and changing rooms. The public beach is becoming even more popular now that the new crafts market is open with shops, restaurants and bars just a few steps from the sun and fun. If you want to relax, go on a weekday and you’ll have the beach pretty much to yourself. 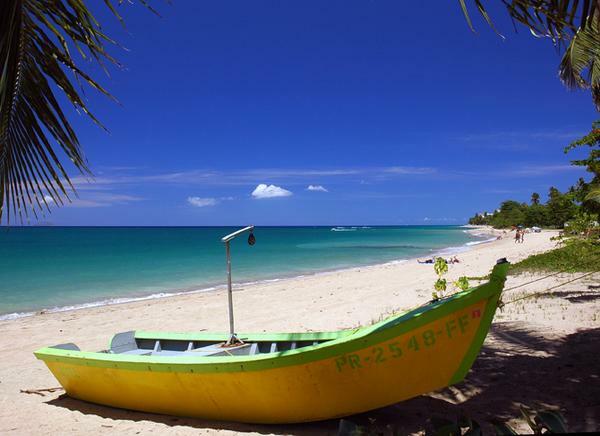 On weekends, this beach becomes very busy with lots of fun-loving families having picnics and enjoying the sun. This is especially true in July when all of Puerto Rico goes on vacation, and the public beach is packed every day of the week! 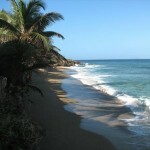 Córcega Beach: You’ll have to drive past Downtown Rincón and south on Route 115 to get to this beach. It’s known for its calm, clear-blue Caribbean waters. 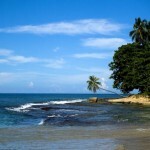 It starts at Parador Villa Antonio on the north, continues past Villa Cofresí Hotel and extends past Tres Sirenas Inn. Barrero Beach: Further down the coast, you’ll find Barrero Beach, where many of the new condominium developments are located. Since there aren’t any large hotels or resorts on this section of the Caribbean Coast, you’ll find lots of beach and not very many people. Of course, this means that there aren’t any public facilities, restaurants or beach bars — but that just adds to the attraction for those who prefer a less-active beach. 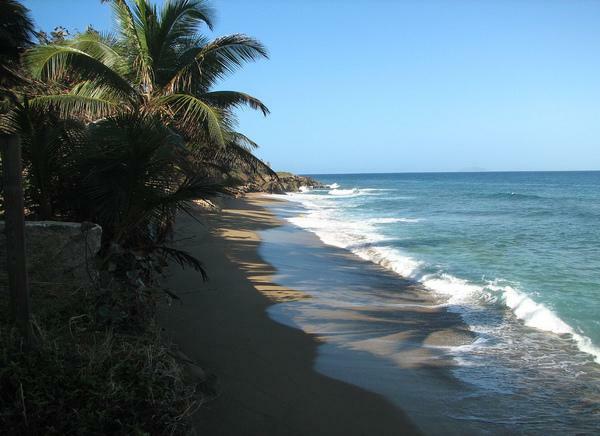 Almirante Beach: As you near the southern end of Rincón, you’ll find this beach, which “comes and goes” with the tide as it clings to the cliffs near the Horned Dorset Primavera Resort and the Rincón Beach Resort.